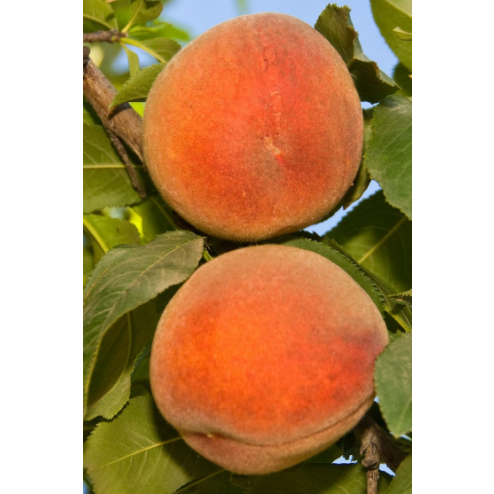 Excellent yellow flesh peach for mild winter climates. Very Sweet and juicy with an amazingly delicious flavor. Red over yellow skin, freestone with firm flesh. Ripens late May to early June. 200 hours. Self-fruitful. This favorite is from a chance seedling found in Long Beach, California. Long Beach peach trees are deciduous in the winter. The leaf out in the Spring and have beautiful pink blossom. Then, the Summer follows with an abundance of medium to large amazing fruit. Trees can be kept under 10 feet tall and wide, but grow larger. In the Spring begin to water peach trees regularly. The frequency and quantity depends on the type of soil and climate. However, in most loamy clay soils in a Mediterranean climate, Start by watering young trees weekly. Increase the frequency during the hot summer months. Make sure to water deeply so the water drains past the root system. Citrus trees grow best directly under the full sun all day long but will do just fine if they receive sun only half the day. Basically, any citrus tree will need only about 6 hours of direct sunlight per day to have enough energy to produce flower blossoms and fruits. Heat Stress - Citrus trees can become stressed from high temperatures and little water during an extreme heat wave. Symptoms can include yellowing leaves, even dry, brown color leaves that look burned. Increase the frequency of irrigation session during a heat wave to prevent stress to your citrus tree. Plant other ornamental shrubs, vines, ground cover, and large trees nearby to create some shade that reduces the temperature, cooling the surrounding landscape. It's also useful to mulch because it will reduce water loss from the surrounding topsoil. Paradise Nursery's citrus trees are self-pollinating and are grafted onto rootstock that is pest and disease resistant so that our tree begin to produce fruits immediately and grow to have a strong and healthy root system. Soil and Planting: Plant in soil that drains well. Dig a hole that is as deep as the tree's roots and at least twice as wide. Place the tree in the hole and backfill around the plant's roots with a mixture of the native soil and high-quality planting mix that has washed sand and organic fertilizer. Citrus trees are generally pruned to be about 10-20 feet tall. Plant your citrus trees about 10 feet apart. Provide more space to allow your citrus tree to grow larger. Commercially citrus trees are often planted 15 feet apart with 20 feet rows for machinery. A standard form citrus tree has a single trunk and a canopy that generally starts a few feet from the ground, eventually where people can walk or sit under. Dwarf citrus trees are genetically identical to standard citrus trees. The tips are simply trimmed when the tree is very young so that the plant grows rounder like a large bush. Dwarf citrus trees are easier to harvest due to the lower canopy, but you can never sit under occupies a wider area at ground level. You would always be next to a dwarf citrus tree, and would not go under. Dwarf citrus trees are great for containers and to keep a shorter tree to prevent blocking a view. Newly planted citrus trees should be watered about twice per week. Adjust the frequency based on weather conditions and soil type. Create a water well or basin around the drip zone to collect the water for the tree's roots. Provide enough water to saturate the entire root zone. To give enough water run a sprinkler for 20 minutes. A bubbler system can provide enough water in 6 minutes while a drip system would run for 2 hours to saturate the soil. Fertilize citrus trees with a balanced fertilizer. Use the manufacturers general recommendations. Organic sources of fertilizer include manure and blood meal. Bone meal is a great source of phosphorus. Potash is often used as an organic potassium input in agriculture. Specialty fertilizers that contain a balanced amount of NPK are commonly available and often sold as citrus food. Prune fruit trees in the Winter to maintain size and shape to prepare for Spring growth. Thin the tree in the Summer, and remove excessive fruits. Remove any dry twigs and branches. Cut off any new growth below the graft or very low in the tree, this will direct the plant's energy to its main branches. Thin your trees during the Spring and Summer seasons to ensure the plant’s energy is directed as desired. If the plant provides an overly large quantity of fruits for that branch. Reduce the quantity of fruit so that what remains grows larger. This will also prevent broken limbs. Harvest ripe fruit to prevent undesired pests. The basics of integrated pest management is cleanliness and the use of a combination of methods. This means we use of organic pesticide when the pest population reaches a threshold that requires action. Horticultural oils such as Neem oil is an organic pesticide that controls tiny, soft bodied insects. Use organic Bordeaux and Liqui-cop to manage fungus causing diseases such as powdery mildew, rust, and leaf-curls. Keep a clean environment, free of weeds and dropped fruit that host insects or attract animals. Harvest when fruit reaches size and store indoors. Use repellants and bird netting to protect your harvest from other animals. During the Summer heat waves, even citrus tree A lack of water can cause citrus trees to become heat stressed when growing under the intense full sun all day in hot dry climates. During a heatwave increase irrigation frequency and if possible spray down the tree with water to cool the plant leaves. Signs of heat stress include brown, yellow, and dry foliage caused by the breakdown of chlorophyll from high temperatures on leaf surface due to the closure of their stomates. Deciduous trees grow best directly under the full sun all day long, but will do just fine if they receive sun only half the day. Basically any deciduous tree will need only about 6 hours of direct sun light per day to have enough energy to produce flower blossoms and fruits. Heat Stress - Deciduous trees can become stressed from high temperatures and little water during an extreme heat wave. Symptoms can include yellowing leaves, even dry, brown color, burned looking leaves. Increase the frequency of irrigation session during a heat wave to prevent stress to your deciduous . Plant other ornamental shrubs, vines, ground cover, and large trees nearby to create some shade that reduce the temperature and cool the surrounding landscape. It's also useful to mulch because it will reduce water loss from the surrounding topsoil. The two factors that determine if a deciduous fruit trees will grow well and produce fruit in a certain area are the Chill Hour Requirement and the Cold Hardiness of that plant. “Chill hours” are the amount of cold a deciduous fruit tree needs to experience during the winter to produce flower blossoms in the Spring that become fruits later in the season. This is measured in the number of hours below 45 degrees Fahrenheit. At Paradise Nursery we only grow low chill types that occurs in the entire U.S. The second factor is Cold Hardiness. Cold Hardiness refers to the minimum temperature a plant can tolerate. (Grafting/Cutting) Most of Paradise Nursery’s edible plants are self-fruitful. Self-pollinating trees do not require an additional tree to produce fruit. For your convenience, we have indicated which trees require a pollinator, and their associated pollinators. Only the sweet cherries, avocados, and some plums require a pollinator. All of our other propagated edible plants do not require a pollinator. All of our edible plants are either grown from cuttings, budded, or grafted. This way, we can ensure that our plants are high quality and fruit immediately. Plants will generally begin fruiting within a year of planting. Create a basin around the roots drip zone so that water collects. Water deeply until the roots and nearby soil is saturated and reaches field capacity. In the home orchard, plant trees about 10 feet apart, and trim them to stay between 8 - 15 feet tall. In a commercial farm, apple trees are spaced 15 feet apart with 20 feet rows are machinery. These trees are grown to 25 feet tall. An apple tree can become almost 40 feet tall in nature. Dwarf Standard and Semi-dwarf Form: Our trees are grown in standard and semi-dwarf forms. A standard tree grows tall because the tip continues to grow. The tip of a semi-dwarf tree has been cut about 2 feet from the ground, therefore the tree has a shorter branching structure for easy picking. Provide newly planted fruit trees irrigation water about twice per week. Adjust the frequency based on the soil type and weather conditions. Irrigate about weekly at the beginning of spring and increase the frequency to 2-3 times per week in the summer. Reduce the frequency of irrigation to about weekly when the weather cools in the Fall. It is important to discontinue irrigation water while dormant in the winter. Create a good berm or watering well around the trees drip zone to allow water to collect for the trees roots. Fruit trees and edible plants need nutrients to grow. This is called fertilizer and comes in different forms. Use organic manure, bone meal, blood meal, and humus based fertilizers. Apply fertilizers like manure along with a bone meal, humus based phosphorus fertilizer (1-2-2) NPK ratio in the late winter, right before spring growth. Reapply with organic high nitrogen (2-1-1) or fertilizers with a 1-1-1 NPK as directed by the label during the Spring and Summer growing season. Do not fertilize in the Fall, new growth at this time will be thin, lanky, and weak.